Using methi for hair is a cost effective way to give your hair a proper care. Fenugreek in Tamil is Vendhayam. Vendhayam is an annual plant in the family 'Fabaceae'. Fenugreek seeds are widely used ingredient in Indian dishes. Fenugreek seeds are in cuboid shape. They are in yellow-amber color. Fenugreek seeds naturally gives bitter flavor to the dishes. So, we have to use it in appropriate quantity. Fenugreek in Tamil is Vendhyam. It is widely used for hair growth and hair fall control. You can get healthy hair, clean, clear and glowing skin even when you take it internally. It has a lot of health benefits and also good to use methi for hair and skin. Fenugreek leaves are used as herb. Both fresh and dried fenugreek leaves are used in India. We use fresh fenugreek leaves(Methi leaves) for making methi paratha and so many dishes. We use dried fenugreek leaves(Kasuri Methi in Hindi) almost in all North Indian gravies especially in hotels. There is no comparison available in the world to compare with the aroma and taste that dried fenugreek leaves(Kasuri Methi/Kasoori Methi) gives. Fenugreek seeds are also used widely as spices. Fenugreek in Tamil is Vendhayam. In Tamil Nadu, we saute fenugreek seeds(Vendhayam) after tempering mustard seeds while making kuzhambu dishes like Puli Kulzhambu, Sambar, Vatha Kuzhambu and so on. It gives slight bitter taste to the dishes. So, we have to use it in limited quantity. Fenugreek sprouts and microgreens are also widely used. Fenugreek is called as Samudra Methi in its microgreen form as it grows near the sea. Fenugreek powder(Vendhayam powder) is widely used in making pickles. It instantly enhances the flavor and aroma of any pickle. The pickles made with fenugreek seeds and without fenugreek seeds have enormous difference in taste, flavor and aroma. I am very sure about it. I have posted few Indian pickles recipes in this blog. How to make Fenugreek seeds powder(Vendhayam powder)? To reduce the bitterness of Vendhayam, we have to roast it first. Just roast the fenugreek seeds in a pan. You do not need to add oil for roasting. Dry roasting is enough. If you want you can add 2 drops of edible oil. Cool the fenugreek seeds down after roasting. Once it becomes cool, grind it in a mixer. It is not easy to get a fine powder if you make fenugreek powder in small quantity. You have to grind it again and again. I usually make a coarse fenugreek powder and use it. How to make Kasuri Methi(Kasoori Methi) at home from methi leaves? You can easily make Kasuri Methi at home. There is no one who does not love the aroma and flavor that can be given by Kasuri Methi leaves. To make kasuri methi leaves, we need just fresh methi leaves. Pick only good and fresh methi leaves. Discard the damaged methi leaves. Sun dry the methi leaves till the moisture is gone. Methi leaves shrink and gets dried while drying under sun. Store it in an air tight container for longer shelf life. Keeping Kasuri Methi in fridge gives the best shelf life. Do not forget it to keep it in an air tight container. Using methi for hair is really good and effective. Vendhyam is one of the best home remedy for hair fall. My mom used to mention about a simple home remedy which works well for hair loss. When one of my aunts got affected by chicken pox during childhood days, she suffered severe hair loss. My mom was also a little girl at that time. Grannies take fresh aloe vera leaf and cut vertically just half way. It should not be cut completely into 2 pieces. Do not cut deeply. Keep fenugreek seeds inside the aloe vera leaf and close it. Tie it with a thread and keep it overnight. You can see the fenugreek seed sprouted. You can use it in 2 ways. 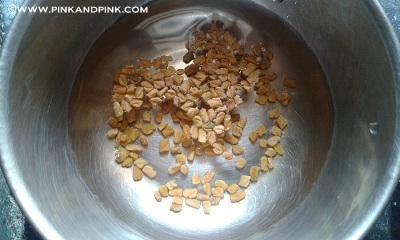 You can sun dry the fenugreek seeds till the moisture is gone. Soak the dried seeds in coconut oil. Another way is grinding the fenugreek seeds along with the fresh aloe vera gel from the leaf. Apply this ground paste on the scalp. My mom told that they followed the second method continuously for my aunt's hair. She completely recovered from hair loss very quickly. It is a widely used method for controlling hair fall, hair loss control and to promote hair growth . I have posted a homemade hair pack recipe with neem, fenugreek seeds, moong dal and curd for hair growth - methi for hair. You can check it here - Fenugreek hair mask. I have also posted another fenugreek and hibiscus hair mask recipe. Check it here - hibiscus for hair. If you ask me a simple home remedy to maintain your hair from home, I will tell you fenugreek hair mask recipe. Using methi for hair is a simple and effective natural hair care. It is a very simple hair mask recipe which anyone can make using methi seeds. Apart from using methi for hair by making a fenugreek hair mask externally, you can add methi seeds internally to get the full benefits of methi. Just take a teaspoon of methi seeds, soak in water overnight. Consume the methi seeds and soaked water in the morning. It reduces the body heat very well. If you are suffering hair problems due to overheat of the body, you can easily get rid of all those hair problems in just few weeks. If you are someone who gets cold by using even natural coolants, you cannot try this. Asthmatic people and people who suffer from Sinus problems should not use it on your hair. You will catch cold very easily. Using methi for hair is a wise choice but it should be used only if your body can accommodate it. Take a handful of Methi seeds. Soak it in water overnight. Grind the methi seeds along with the water in a mixer and make it a paste in the next morning. Apply this methi seeds hair mask on your hair. Cover your head with a plastic wrap or shower cap. Leave it for one hour. Wash it with a mild shampoor or shikakai. Do not use hard water for soaking and grinding. You can apply this methi seeds hair mask once in a week. Methi seeds can give volume and shine to your hair. It makes your hair soft and better. Methi seeds can control your hair fall and promote hair growth. You should follow this methi seeds hair mask procedure continuously to see the visible results. After 3 months, your hair will be better than ever. You can also drain the water before grinding methi seeds. Drain the excess water and make a methi paste. You can add little curd to the paste and add it. Curd is also a natural coolant. You have to use it carefully based on your body condition. You can soak few neem leaves and curry leaves also along with methi seeds. You can add one tea spoon of lemon juice with the methi seeds hair mask before applying on your hair. Adjust the quantity of lemon juice according to your hair length. Do not forget to concentrate on your scalp. Applying on the hair strands cannot help you much. Take sections of your hair and apply the methi seeds paste on the scalp. Cover the entire scalp. Then apply on the hair strands. Since vendhayam has ability to remove the toxins from the body, taking it internally helps you to get clear and glowing skin. Just take a teaspoon of methi seeds, soak in water overnight. Consume the methi seeds and soaked water in the morning. It helps to remove the toxins from the body very easily. It also reduces the body heat very well. If you are suffering skin problems like pimples, acne due to overheat of the body, you can easily get rid of all those skin problems in just few weeks. You can apply fenugreek curd mask(as mentioned in fenugreek seeds for hair section) on your face. Even ground paste of overnight soaked fenugreek seeds can also help. Just apply it on the affected area. You can see your skin turning shiny, clear and glowing in few weeks. The first and foremost vendhayam benefit for women is its ability to increase milk production in feeding mothers. Using Fenugreek in Tamil Nadu and all over India is not something new. Fenugreek seeds have been relied upon for increasing milk supply since ancient times. Even Fenugreek tablets are available for increasing milk production. The best way to use vendhayam for lactation is very simple and can be easily done in home with just 2 ingredients. It is nothing but vendhayam and water. Soak Vendhayam in water overnight. Consume it in the morning. Eat both vendhayam and the soaked water. I am one who really enjoyed the benefits of vendhayam during lactation. I used to follow it daily without fail. I just use 2 tsp of vendhayam soaked in water and consume it next day morning. The dosage might be modified according to your need. But you should not consume it too much. Do not expect increased milk production or significant changes in just one day. Wait for at least 3 days to see the visible results. Other than Vendhayam water, try to include fenugreek seeds in the dishes you include in your diet. As mentioned in the culinary uses section, you can include the fenugreek seeds in kuzhambu, sambar and pickles. Sadly, few people might have negative reactions by consuming vendhayam. People who easily get cold by consuming natural coolants would get cold easily. If you are such one, start with low quantity of vendhayam initially. Try with 1/4 tsp for the first 4 days. Then increase it by another 1/4 tsp. You can increase it gradually until you are in comfortable zone. Asthmatic people and people who have sinus problems need to slowly increase the quantities. My friend was not able to consume it just because she gets cold whenever she has vendhayam water. Instead of completely stop eating the vendhayam soaked in water, you can first reduce the quantity of vendhayam you soak. You can try with 1/2 or 1 tsp. If you are not able to control your cold, then you can try drinking vendhayam water alone. The concentration will be low. Still you can get the benefits of vendhayam even though you will be not be able to enjoy the benefits of vendhayam fully. Methi is a natural coolant. People who are suffering from Asthma and sinus problems should be cautious in using Methi. Vendhyam is able to reduce the blood sugar level. So, people who are suffering from diabetes and taking diabetic medicine should be very cautious in taking it. Consult your doctor if you are suffering from any health problems. Vendhayam should not be taken in more quantity during pregnancy. You should consult your doctor about inclusion of vendhayam in your diet during pregnancy. Hope you find the post Fenugreek in Tamil | Methi for hair | Vendhayam | Fenugreek Seeds for hair and skin with Health Benefits useful for you.